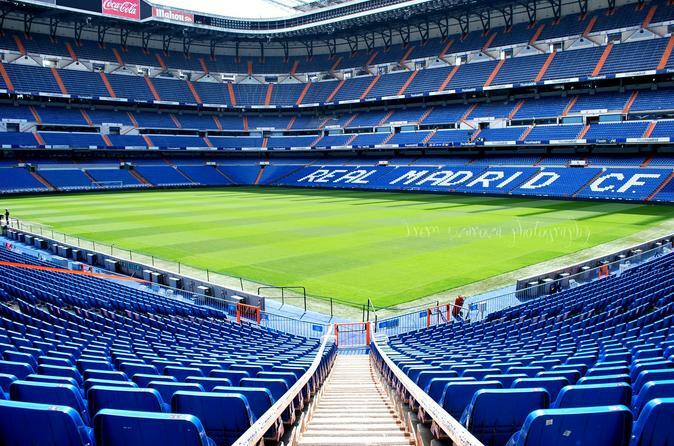 Don't miss your chance to visit world-famous Santiago Bernabeu Stadium and Real Madrid's museum. It's classified by UEFA as an elite stadium and awarded top 5 stars. After you are done exploring the stadium and museum, a private guide will introduce you to such emblematic monuments of Madrid, as Plaza Cibeles, Paseo de Recoletos, Plaza of Castilla, new Madrid Towers and financial center. You will be picked up by a private guide and driver from your hotel at 10 am and transferred to Santiago Bernabeu Stadium, home of Real Madrid soccer team.Your guide will take you to all the places allowed by the club for tourists to visit. Can you imagine walking freely on Real Madrid's stadium with your own private guide? This is your opportunity to enjoy these amazing moments that you have always seen on TV. During the stadium tour you will be able to visit the playing field itself, “Best Club in History” room, sensations room, the photo-montage, the pitch, presidential box, Real Madrid's dressing room, the tunnel, dugouts and technical area, the press room and the official store. Once you finish exploring the stadium and museum your private guide will take you on a short sightseeing of modern Madrid with its own places worth to see. Your first stop will be Plaza de Cibeles. It is a square with a neoclassical complex of marble sculptures and fountains that has become an iconic symbol for the city of Madrid. The Plaza is currently delimited by four prominent buildings: The Bank of Spain, the Palacio de Buenavista, the Palacio de Linares and the Cybele Palace. In the years Cybele Palace and her fountain have become symbolic monuments of the city. Then, take a stroll down Paseo de Recoletos, a wide boulevard in central Madrid. Continue to Plaza de Castilla with its famous Puerta de Europa Towers and Caja Madrid obelisk. Finally, visit Cuatro Torres (Four Towers) Business Area, a business district located in the Paseo de la Castellana. The area contains the tallest skyscrapers in Spain, the Torre Espacio, Torre de Cristal, Torre PwC and Torre Bankia. The complex was formerly known as Madrid Arena. After this tour is over you can be transferred back to your hotel or stay in the city if you wish.